Getting web governance right isn't easy. It is likely that you will have to experiment with a few different approaches before it finally takes hold. My User Experience colleagues sometimes refer to the principle of Iterative Design. This is based on the knowledge that few websites are 100% perfect when launched. Ongoing tweaks and changes will always be needed. Successful websites recognise this by investing in skilled staff. Such staff combine insights from analytics and user feedback with their own expertise, to build progressively better experiences. No governance system - no matter how well designed - will be 100% right when implemented. What can seem a great idea during planning simply may not work in practice. Look at the attached photo. 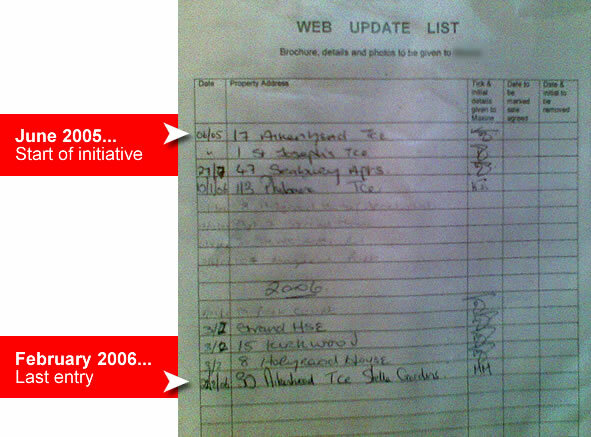 It shows an update schedule for a small firm’s website (that will remain anyonymous). It was pinned to the wall of a supervisor's office. This schedule is an artefact of a procedure that didn't work or is no longer needed. Because I know that the website concerned is well maintained, it shows that the business has moved on. Perhaps they found that the paper-based approach did not work. Perhaps they migrated to a CMS system. It is tempting to think that this photo shows a governance failure. It shows trial, error and development. It shows governance 'in the wild'.